Kairali Ayurvedic Products, this festive season brings in amazing Ayurvedic festive celebration offers when you buy products online. These are wonderful festival offer for your loved ones on this festive celebration. Enjoy this special offer on all Ayurvedic products, where you can shop for Rs. 1000 and get Rs. 300 off. This offer can be availed with the coupon code FESTIVE300. 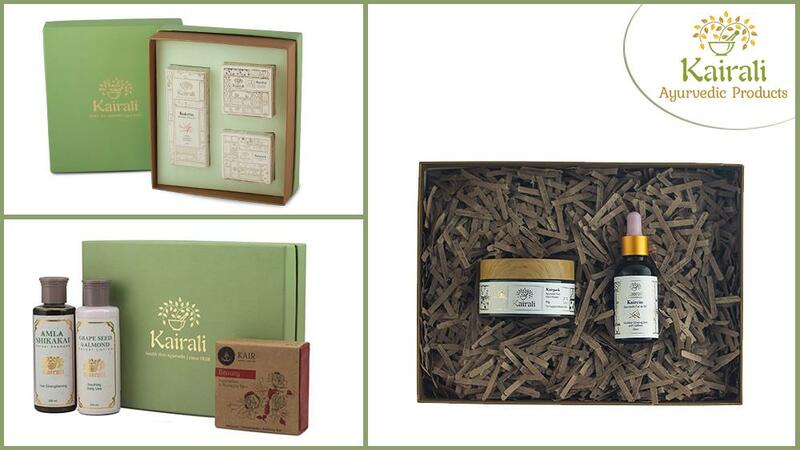 This beauty gift box from Kairali is a wonderful gifting idea to maintain a beautiful and a healthy skin. This gift box contains Kaircin 25 ml, Kairpack 85 gms and Kairbal 180 gms and can be purchased at an introductory price of Rs. 1999. Keeping the beauty of the skin and body intact, this gift box helps to enhance the glow and radiance of the skin. The face care gift box consists of Kaircin 25 ml and Kairpack 85 gms that gives a youthful glowing complexion, thus retaining the natural glow of the skin. This gift box can be purchased at an introductory price of Rs. 1499. Share the bond of friendship and love by gifting this wonderful gifting set. These festive gift offers are a chance to spread love and happiness.